The remnants of Tropical Storm Barijat contributed to a soggy start of the Cathay Pacific Trophy tournament and after weathering a few light showers in the beginning, it turned out to be beautiful day. The greens were in very good condition considering how much rain we have had and it was a lot of fun to have the newly completed 17th hole in one of our events for the first time. 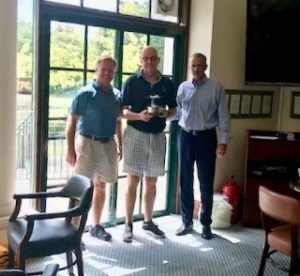 Winning for a 3rd time in 2018, Noel “The Trophy Collector” Prentice, added to his hardware collection the highly coveted Cathay Pacific Trophy. Embracing his adjusted handicap, Noel was able to post 37 Stableford points in less than ideal conditions to clinch first place. YB Rai, shot a very respectable 77 gross, earning the Runner-Up position. Team Comp : A solid 90 points by Team Carel, Noel, and guest Matthew Burke.